Mold and mildew on decks will also eat through and deteriorate deck stains that are there to protect the wood. 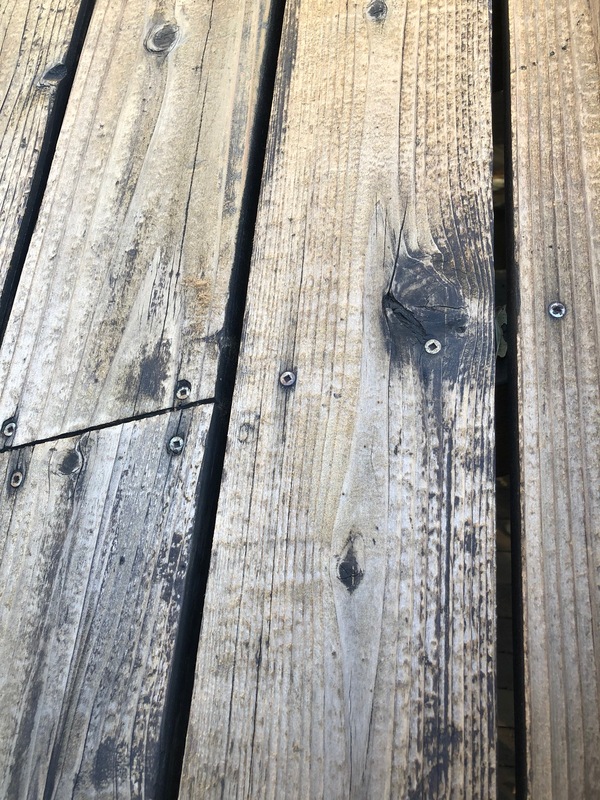 Mold on decks is not a unique situation, it is rather common so do not be worried if it has happened to your deck. The good news is that mold/mildew can be cleaned off of wood before it does harm. Most wooden decks should be cleaned and re-stained every 1-2 years as maintenance. Regular cleaning with a deck cleaner will help ensure that mold/mildew does not infiltrate your deck in any form. Another way to combat mold on decks is to apply a mold resistant deck stain or sealer. A deck stain that combines trans-oxide pigments or mildewcides will help you win the war with mold/mildew on decks. I’ve been cleaning and cleaning but not luck removing the mildew(?). First I used Valspar All-In-One Deck prep per instructions and scrubbed with a stiff brush. Then I did the same with Wet and Forget and so no improvement…yesterday, I used Biokleen Oxygen Bleach powder twice. I’ve still got black spots on the deck. I’d read that power washing would destroy the soft wood particles and shorten the life of the deck. But, after reading your great site, I think that a pressure washer is the way to go. I’ve scrubbed and scrubbed with no luck. What should I do next? You apply and then pressure was off. If that does not get it all off, bleach is your last resort. we do not like to use bleach but sometimes you have no choice. Mix 1 part bleach to 4 parts water. Apply, let sit for 20 minutes, then rinse well. 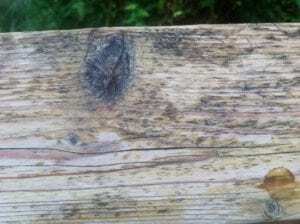 I have treated mildew on our wood deck with 1/2 strength vinegar and dish soap, but staining remains. Does this mean the mildew has not been killed or will the stain remain anyway? Should I treat it with something else before applying the oil/stain? Love the website. Ready for stain. What is the best mold resistant stain with trans-oxides or mildewcides ? Look at TWP 100 Series or Restore A Deck Wood Stains. Our deck is in the NC mountains. It’s very moist.lots of green mold/mildew. 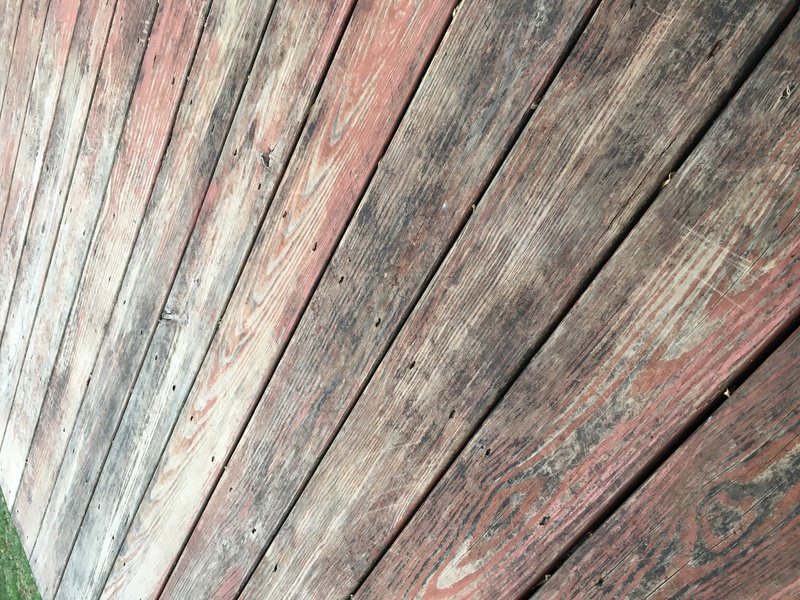 Which deck stain/paint would be the best? Has it been stained or painted before? due to low funds we had to deck our deck with plywood, there are a few areas that have a greenish grow of algae or moss or lichen. How could I clean this off and what could I seal it with to prevent or slow down future growth. Need this to last 20 months until I can replace with deck boards. Use Restore A Deck Cleaner/Brightener kits and the Restore A Deck Stain in Natural. Do you recommend deck over products? We are getting our house for sale. 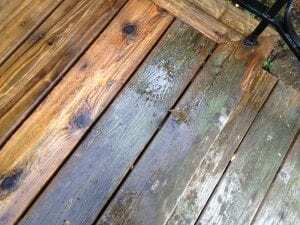 What are the best deck stains to inhibit mold and mildew? 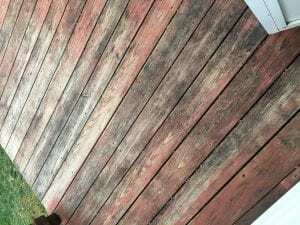 Defy Extreme or Restore A Deck Wood Stains. Used to be. They then sold the company and changed all the formulas. Is it necessary to use cleaner and brightener on new cedar deck that has seasoned if it isn’t that dirty? Yes. You have to remove the mill glaze. 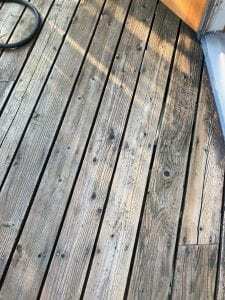 Is this mold/mildew on our Redwood deck? 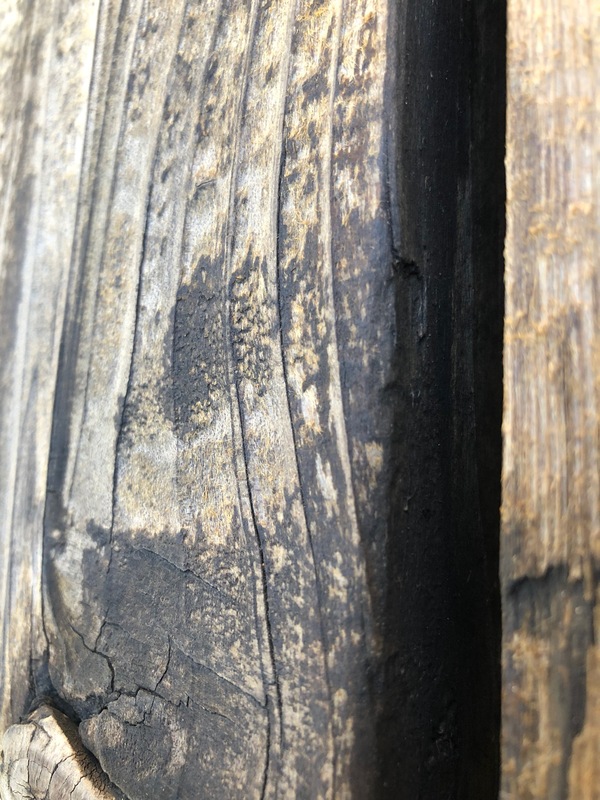 At first I thought it was pollen and dirt that got stuck to the old stain which then turned black from sun exposure, but after doing a bleach spot test in the corner and seeing the bleach uncover the wood underneath, I thought it must be mold/mildew. So I tried the OxyClean method with power washing it off, but that did not work. Maybe I didn’t make the OxyClean mix it strong enough. When dried, the black stuff is hard as a rock and almost looks like the wood is burnt/charred. What would you suggest to the black out? Will restore a deck really do that? It does not look like mildew. 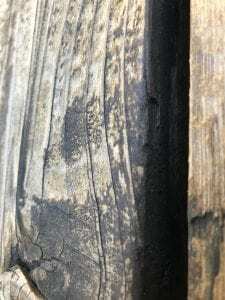 Maybe old deck stain that has turned black? 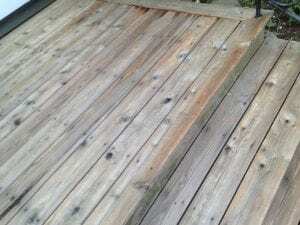 A good deck stripper and pressure washing should remove it. It turns out they sprayed our deck with Thompson’s water seal, which contains paraffin (wax). Although oil based, normal deck strippers won’t get the paraffin off apparently. An “award winning deck contractor” (so he said) said you can dilute ammonia 4:1 to get Thompson’s water seal off. Not sure ammonia is good for redwood and might cause discoloration (not that its a new deck by any means). Otherwise purchase a hydrocarbon remover. Any product you know of designed specifically for removal of paraffin containing deck sealers? You can strip it off. Use any deck stain stripper followed by a wood brightener. We do it all the time. My deck surrounds a pool, so there are places that are prone to growing algae. I used the Restore-A-Deck cleaner MULTIPLE times (spray cleaner, let sit, scrub, repeat) and it still has a slight green tint when wet and is very slippery in those spots. It looks great when it’s dry. Should I do something more to make sure the algae is truly gone before I apply the brightener and stain? That means it is embedded in the wood It will not come out when deep in the wood nor should it show when the stain is applied and dried. Yes. It contains an EPA registered mildewcide. Our Cape Breton, Nova Scotia cabin has clear white pine siding. It sits in a spruce and hardwood forest. The siding was last refinished 7 years ago. Evidently there was not enough or any mold resistant additive in the stain and hence there is tremendous blacking. 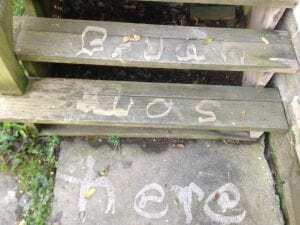 Last summer we tried using a Behr Wood Stripper to clean things up with poor results. We resigned that we would need to sand all surfaces this season – given all the surfaces of the trim details, this will be an extensive procedure. Is there any other wood stripper you have some confidence would give good results in removing the extensive blackening or is sanding the way? What stain did you use and please post some pictures? Reading this background AFTER doing the following: pressure washing the hell out of the mildew etc, including both black and green coverage; stained deck with Cabot Decking Stain 1400 Clear (leftover cans from construction 10 years ago). It rained about 8 hours later, still raining. I also have pressure washed the back steps and railings, and in both cases I know I was taking off splinters of wood, but that was what I had to do to get rid of 10 years of neglect. Now I am trying to learn how to care for my home by myself. Here is a photo of the process and the before photos. After photos are irrelevant until it stops raining. 1. Can I just use a professional sander to sand down the deck and then stain it after that? Or do I have to use the restore-a-deck solution stripper and restorer and power wash again before sanding? 2. When using that sanding machine I am going to need to roll over the new replacement boards while sanding the “old boards” -is it ok to use the sander machine on the new boards or will that damage them? If so, how do I get around the sandpaper touching the new boards-do I have to sand those “in between” old boards by hand? I started with plain water, pressure washing, then applied the Restore a Deck cleaner, soaked & scrubbed as directed. However, before I was able to follow up with the brightener, got called away. So it has dried. (It is a deck in the shade nearly all day). It is now clean & ‘white’ but we still have noticeable green color to about 1/3 of the boards (algae?). 1) should we re-apply some cleaner again, before using the brightener? 2) it looks like we will have to re-stain, as about 50% of the stain from last yr (Big Box Store brand) has worn away on the horizontal surfaces, so should we just proceed with using the stripping RAD product at this point instead? Strip and then brighten would be your best course of action at this point.